Popular video-sharing app YouTube underwent a major update Tuesday, bringing a slick redesign and handful of useful new features like picture-in-picture. 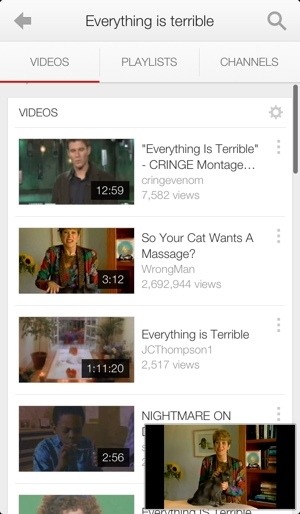 That’s right: YouTube 2.0 is here. Visually, the updated apps help better unite all the Google products on your phone into one cohesive, Android-esque aesthetic. Swipe downward while a video is playing, and the app will go into a picture-in-picture mode. From there, you can continue to search YouTube videos while the current video plays in the lower right-hand corner of the screen. You can dismiss the video by swiping left or right – gestures Android users will find very familiar. The update also gives mobile users access to YouTube playlists, a popular feature on the web version of the site. Playlists are often used there to compile music videos. Many music videos can’t be played on mobile devices due to copyright rules, but the added functionality is still welcome. If you already have and use the YouTube app, you should take a moment and update it. The changes make YouTube slightly more touch-friendly on phones, but they really shine on the larger screen of a tablet – especially the picture-in-picture feature. The updated YouTube app is currently available for download on Google Play and the Apple App Store. If you don’t have a smartphone, you can still get in on the graphic design love: The main YouTube website got a graphic refresh to give it the same feel as the mobile apps.